George Blight was born on December 2, 1866 at Merton, Devonshire, England. He immigrated to Wilton, Ontario with his parents about 1870. In 1889, he came west to High Bluff and in 1890, purchased 240 acres of land (the south-east quarter of Section 31-11-4W and the north half of the north-east quarter of Section 30-11-4W), two miles north of Oakville, at $5.00 per acre. The land had originally been given out by the government as part of the Metis Land Grants. In January 1891, he married Isabella Mary Dixon of Nissouri West, Ontario and brought her out west. They travelled by C.P.R. to High Bluff and drove to their home with a team of oxen hitched to a sleigh. The interior of the house was unfinished, and one day Mrs. Blight decided to nail the laths onto the kitchen walls to prepare them for plastering. When her husband came home for supper, he found she had done an excellent job but had misunderstood how far apart to place them! They all had to be removed and nailed back on closer together. 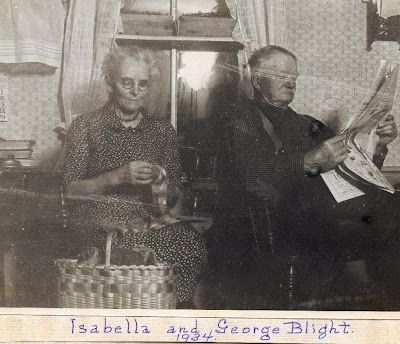 George and Isabella raised ten children, who all received their education in Oakville School, grew up, and took careers of their own choosing. Young people from Beautiful Valley often joined the Blight children for skating parties on the La Salle River. Skating was followed by a singsong and dance in Grandpa and Grandma's living room, with Grandma sitting in front of the china cabinet to protect it from damage by the lively young people. Mr. Blight was a jovial man who enjoyed having his home used for community gatherings. He served on the school board for years. In fact, his name was the first one on the list of people attending the first school trustee meeting held in Brandon. Mrs. Blight, while an excellent cook and good housekeeper, was also a diplomatic leader in her community. She was President of the local United Farm Women for years and was appointed to be a representative for Ward 6 of the R.M. of Portage la Prairie as a volunteer community social worker, a job she performed for some 20 odd years. She also served on the board of directors of the Portage Fair for about 25 years, helping to look after the Women's Exhibits of cooking, canning, fancy work and sewing—three busy days away from home each year. SUDDEN DEATH OF GEORGE BLIGHT SR.
George Blight, Sr., one of the prominent farmers of the Oakville district and very well known throughout this community, died very suddenly this afternoon. Up and about as usual, he was stricken by a heart attack shortly after 2 o'clock and passed away before a physician, hurriedly called, reached his home. He was sixty nine years of age. In addition to his farming" activities, Mr. Blight was an energetic and influential worker for many organizations and associations, making a 'contribution to his community. For many years he was a capable trustee on the Oakville School Board and was one of the strong supporters of the United Farmers of Manitoba and, had held various offices in that body at different periods. In politics he believed in the policies of Liberalism and throughout hits lifetime had been a supporter of that party. He was a devoted mernber of the United Church. In final tribute to the memory of George Blight, Sr., prominent farmer of the Oakville district for forty five years, there was an exceedingly large attendance of relatives and friends at the funeral service held Monday afternoon from the family residence. Rev. J. D. Gregg, of Oakville United church, conducted the service. The pallbearers were : J. F. Thompson, John Burnett, Wm. Holliday, J. H. Bray, A. Hawker and John Metcalfe. Wreath-bearers : Wm. Thomas, Ed. Craig, Jas. Bartlett, Robert Lees, John Tooth and Dr. A. A. Alford. Burial was in the Oakville cemetery. McKillop► Funeral Home conducted the funeral arrangements.